abortions in New Zealand in 2017. Booties Project lead organiser Elaine Borger told NZ Catholic the display was a “very moving memorial to lives lost to abortion” as well as “a tangible element to show the gravity of the situation”. “The true measure of success will be if the consciousness of New Zealand is awakened. Success will be if the tides are turned and babies are saved . . . if it solidified people’s stance for the value of life,” she said. Mrs Borger said the booties would be donated to maternity clinics all over the country, although 121 pairs were sent to MPs with a card asking them to remember the lives lost and that 18 per cent of pregnancies ended in abortion last year. One pair was sent to Children’s Commissioner Judge Andrew Becroft. VFL national president Jacqui de Ruiter vowed that her organisation will always be a voice for the voiceless as she thanked MPs Simon O’Connor (Tamaki — National) and Chris Penk (Helensville — National) for being bold and courageous and standing up for life. Both MPs spoke at the event. “One of the ironies I find in politics is that certain groups of people make a really big talk about tolerance, dignity and openness. Isn’t it funny that they are the hypocrites who never want other voices to be heard?” he said. Mr Penk raised the issue of depression which afflicts a lot of women who had undergone abortion. “My challenge to fellow policy-makers is to consider the question of mental health in the context of abortion and what that does to families and indeed, the wider community that we live in,” he said. Family First national director Bob McCroskrie noted the irony of the pro-choice group playing Madonna’s song, Papa Don’t Preach, to disturb the pro-life speakers. “I was hoping the song they were playing would continue. It has a beautiful line in it: I’m keeping my baby. It’s a beautiful song. I thought it was a perfect theme for what we are doing here,” he said. Mr McCoskrie read the statement of Buttons Project founder Marina Young. The Buttons Project is aimed at helping those who suffered depression after abortion by acknowledging their loss. 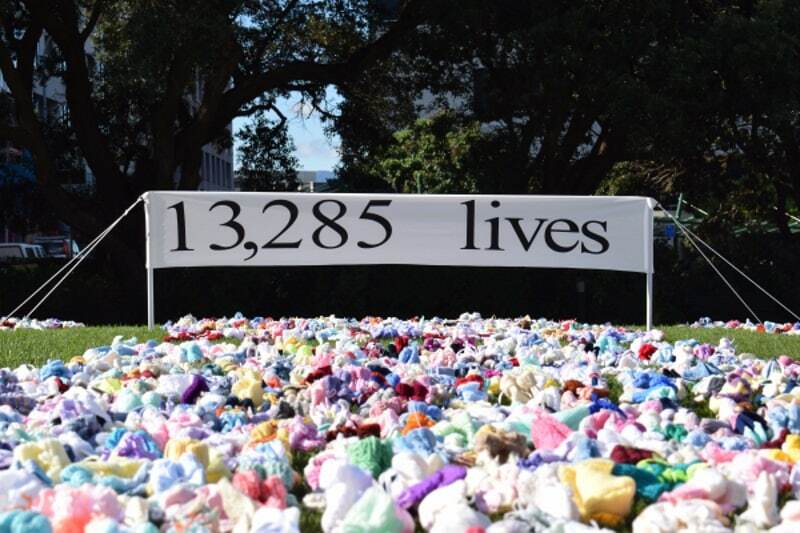 “Seeing 13,000 pairs of booties with each pair symbolising each baby lost to abortion is quite sobering. I, then, think of 13,000 women changed in some way through the abortion experience, the often forgotten fathers, the ripple effects the event has on others,” Ms Young’s statement read. VFL communications person Kate Cormack, one of the younger women at the event, said she has not heard or learned anything new from the other group on Parliament’s grounds. feminism, it’s fake feminism,” she said. Ms Cormack pointed out that the booties could be representing a baby who would have celebrated his or her birthday and that many of those aborted were female. “Half of these would have been women. How is that pro-women? Where is their bodily autonomy? Where are their rights?” she asked. She also criticised the disrespectful way abortion advocates tried to mess up the display of the booties. “If you want to advocate for abortion, you need to be able to advocate that you’re ok that the unborn child will be killed,” she said. Previous articleIs there truth in Archbishop Vigano’s text and how are Catholics to know?